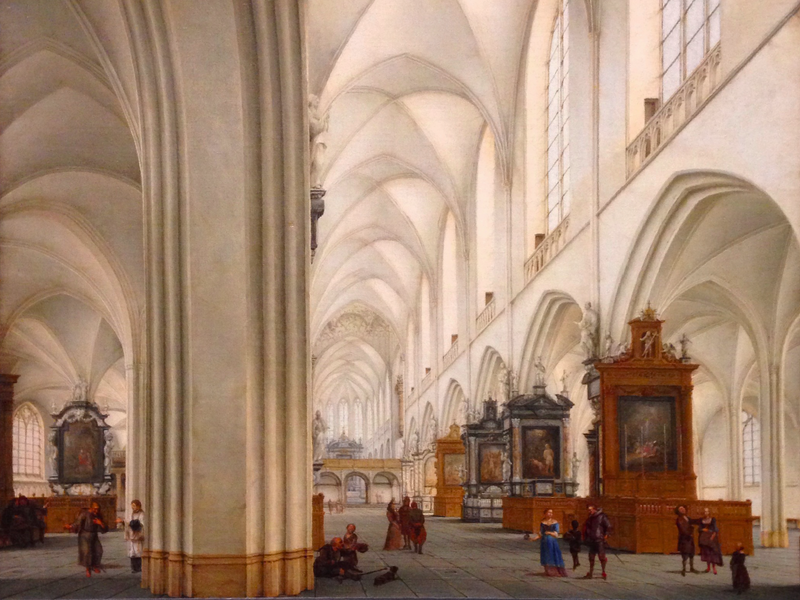 Isaak van Nickelen, Interior of the Bavo Kerk, Haarlem (Fitzwilliam Musem). Photo by author. 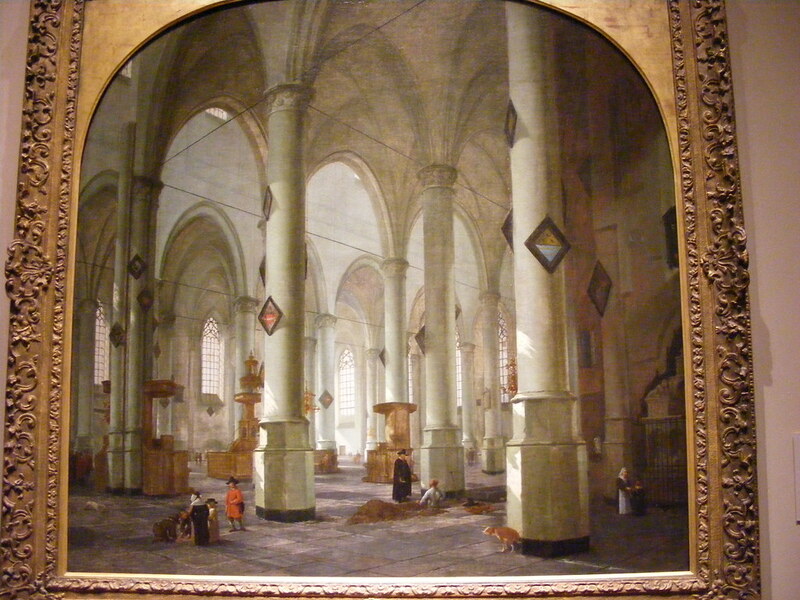 Isaak van Nickelen (or van Nickele) (c.1633 – 1703) painted multiple church interiors of the St. Bavo Kerk in Haarlem. Yet the Bavokerk in this painting—Fitzwilliam Museum 82— does not appear as it did in 1668, when Nickelen painted it. It is filled with altars—elaborate Baroque edifices at regular intervals, with paintings and candles that are otherwise clash with the whitewashed interior we expect in a painting of this Reformed church. On the left, a priest and a monk gesture emphatically. At the top of one of the columns there is a statue of St. Peter with his keys to the kingdom of heaven—the saint most associated with the papacy. Nickelen imagined the Bavokerk as a Catholic cathedral. It had been nearly one hundred years since the Bavokerk had been stripped of Catholic decoration in a riot on the Catholic feast of Corpus Christi in 1578, the so-called “Haarlem Noon.” Nickelen was not merely painting the Reformed church as it stood in his day, filled with Catholic images, although given our preconceptions of what a Reformed church would look like may lead us to believe that. Crucially, the Bavokerk had its walls whitewashed with lime up to 140 years before sixteenth-century iconoclasm, possibly for hygienic purposes. Furthermore, the Protestants had added paintings of biblical texts or tapestries bordered in text onto the white pillars in the sixteenth century to this supposedly image-free space (Mia Mochizuki, The Netherlandish Image after Iconoclasm, 106, 1, 7, 73-4). These Protestant paintings disappear in Nickelen’s work—he performed his own act of iconoclasm before he filled the church with Catholic icons. Nickelen’s unusual choice must be put in context to be understood fully. He lived in one of the great centers for paintings of church interiors, and closely followed the methods of his older and more prolific contemporary, Pieter Saenredam (1597 – 1665), who also painted the Bavokerk multiple times (Perspectives: Saenredam and the architectural painters of the 17th Century, 267). Saenredam also painted Catholicized interiors of the Bavokerk. One such work depicted a fictive bishop’s tomb in it, and was commissioned by the bishop’s chapter of St. Bavo’s (Rob Ruurs in Perspectives, 44-5). The community had been able to continue its existence despite the reformation and the lack of episcopal hierarchy in the Netherlands (Xander van Eck, Clandestine Splendor: Paintings for the Catholic Church in the Dutch Republic, 13). Saenredam’s painting was part of the chapter’s campaign for papal acknowledgment. Typically owning such a painting would have been a visual statement of the owner’s confessional identity (Ruurs, 101). Yet the work did not always reflect the artist’s beliefs. Saenredam is believed to have been Protestant, but confessional lines did not dictate his painting. He had Catholic acquaintances among the Haarlem Catholic community and took on Catholic commissions (Perspectives, 101). In fact, seventeenth-century Catholics in Haarlem often commissioned works of art that were more a restoration or reimagining than a practice in strict realism. In 1630, the painter Pieter de Grebber painted a posthumous portrait—sketched at the exhumation!—of the Haarlem priest Cornelis Arentsz. This portrait, like Saenredam’s, was part of the Catholic chapter’s ongoing battle for historical legitimacy in the eyes of Catholics and Protestants alike (van Eck, 83, 84). It combined realism with an urgency to demonstrate continuous tradition. Similarly, a painting like Nickelen’s created an imagined Catholic space in a real building. 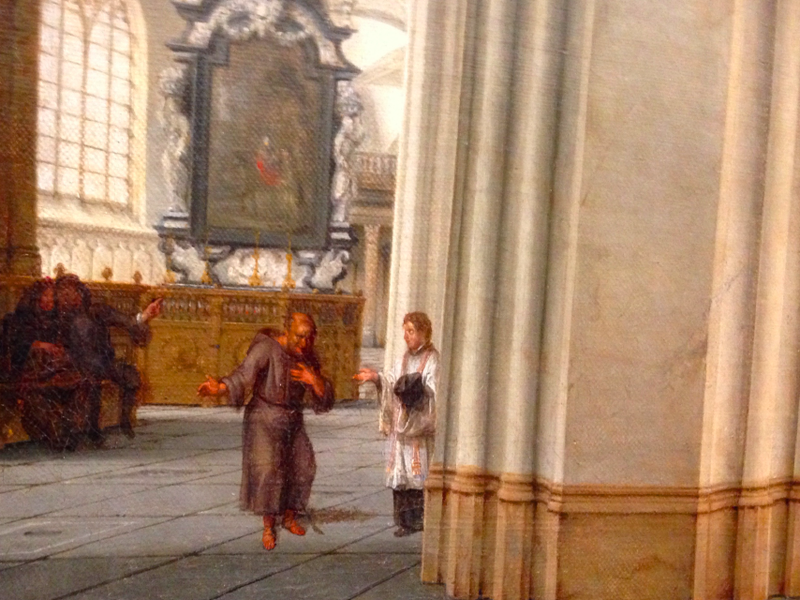 Detail of monk and priest in Nickelen’s “Interior of the Bavo Kerk.” (Fitzwilliam Museum). Photo by author. Seventeenth-century Catholics living in Haarlem were also concerned with promoting the cult of St. Bavo, the most prominent saint in their diocese and namesake of the cathedral (van Eck, 97). Priests in the 1630s worked closely with Ghent, which was also associated with the saint, to reform the sung service of St. Bavo. Printed images of the seventh-century saint made up part of their correspondence (van Eck, 98), again picturing the past to create a narrative of continuity into the present. Haarlem was among the towns in the Dutch Republic with the highest percentage of Catholics—there were at least twenty Catholic priests in the city in 1620, in contrast to six in the state-backed Reformed church. Catholic services were suppressed in public, although private practice was not forbidden and sometimes the authorities overlooked even public events (Steven Nadler, The Philosopher, the Priest, and the Painter, 41-3). A space like the Bavokerk, although officially Reformed, would have nonetheless provided shelter and a public space to the entire Haarlem community, from Catholics to Jews—“a broad public of diverse age, class, gender, and confession bound by a common interest in local society and religious traditions that shared a biblical basis” (Mochizuki, 6). To some extent, this is reflected in Nickelen’s painting, where the beggar and his dog occupy the same space as a well-dressed couple. Nickelen’s confession is unknown but this painting of a Protestant church re-Catholicized speaks to the fluidity of religious identity, especially in religious spaces, in this time. My thanks to Tom Goodwin and Nailya Shamgunova for their help during the research process on Nickelen’s painting in the Early Modern History MPhil Research Challenge at the University of Cambridge. Utterly fascinating: a whole new take on iconoclasm, memory and much more. Those altars really glow, especially against those whitewash-reformed walls. Did they come from antiquarian notebooks or the painter’s imagination? Or both? A comelling–not quite parallel, but comparandum–could be the case of Aernout von Buchel. This Utrecht antiquary, gifted draftsman and friend of Utrecht artists eventually converted to Protestantism. He filled his Diarium with amazing drawings of cities and structures, and devoted himself after he returned home to preserving in images Utrecht’s heritage of Catholic art and architecture. Scholarly/nostalgic anti-iconoclasm? http://bc.library.uu.nl/old-diaries-renewed.html and http://en.wikipedia.org/wiki/Aernout_van_Buchel for references and images. Tony, thank you so much! It is a striking image–the 19c cataloguers of the Fitzwilliam collection even thought it was an interior of Antwerp Cathedral (which was Catholic), although Nickelen never left Haarlem. I’m not sure where the altars come from. There’s so little on Nickelen–the easiest thing to do might be to see where Saenredam gets his images of the bishop’s tomb and other Catholic aspects from, given the enormous amount written on him. Thanks for the von Buchel comparison and the links. I think antiquarians working to preserve the memory of pre-iconoclasm and artists who envisioned a kind of Catholic continuity despite decades of iconoclasm did have much in common, although what’s interesting here is that I believe Nickelen envisioned a contemporary Catholic Bavokerk (those aren’t medieval altars, at any rate!). It would be interesting to delve further into the story of the Utrecht and Haarlem Catholics who were interested in restoring the reputation, liturgy, and apparently church of St. Bavo. Maybe von Buchel would have something on that, too. If Nickelen never left Haarlem, I suspect that he drew his knowledge of contemporary Catholic art and church decor from the vast graphic production of the southern Netherlands, a center of triumphant and triumphalist Counter-Reformation art. Every festival, entry and dedication of a new altar yielded a vast range of visual records in the form of books and prints, and they certainly traveled across the borders. Yes, I think a restoration is right–aside from the whitewashing (which took place in the 15c in the Bavokerk and was thus unconnected to iconoclastic reformation) everything looks new in Nickelen’s painting. It would be very interesting if he was getting these images from Antwerp etc.–maybe the early Fitzwilliam cataloguers were onto something. Lots of variation to account for, probably.